Stephanie Dogfoot lives in Singapore and has been writing poetry ever since her first gerbil died when she was 11. She has been performing since 2008, the summer she stumbled into her first poetry slam in Cafe deux Soleil, Vancouver. In 2010, she won the Singapore Slam Championships and represented Singapore in the Indian Ocean Slam Championships on Reunion Island in December that year. In 2012, she won the UK Farrago Slam Championships and represented the UK in the European Slam Championships in Antwerp 4 days later and came in 2nd runner up. She represented the UK in the Poetry Slam World Cup in Paris in June 2013 and got into the semifinals. Whilst living in London from 2009-2013, she co-hosted Hammer and Tongue Hackney with Sam Berkson, Adam Kammerling and Raymond Antrobus in Dalston and co-founded a night called Forget What You Heard (About Spoken Word) at Ryan’s Bar in Stoke Newington which she hosted with Matt Cummins. She has took her solo spoken word show ‘Foreigner Go Home (With Me! )’ [adventures, cultural learnings and straight up ridiculousness of moving to London from Singapore, via Ohio, with a few post-colonial thoughts thrown in] to the Edinburgh Free Fringe Festival in 2012 and 2013. She has also been a feature poet at the Glastonbury Festival, Small World Festival, Nozstock Festival, Southbank Centre, various squats and pub backrooms and theatres in London, and other cities around the UK, including Brighton, Bristol, Bath, Birmingham, Swindon, Cheltenham, Margate, Oxford and Aberdeen. In November 2013, she went on a tour of Germany, featuring at poetry slams in 11 cities. She moved back to Singapore at the end of 2013. In her first few months, she got involved with organizing and hosting a monthly spoken word night called SPEAK at the Home Club, later Canvas Creative Space and became part of the all-female spoken word troupe Sekaliwags. She also began hosting Story Slam Singapore, Singapore’s first monthly true-life storytelling night, inspired by The Moth, and helps to produce and direct the annual Grand Slam storytelling competition at the Esplanade. In 2014, she featured at the Ubud Writers and Readers Festival. In 2016, she toured Australia, featuring at poetry slams in four cities. In 2017, she got involved with Singapore Poetry Writing Month as a moderator and editor, and edited the 2017 SingPoWriMo anthology, and is an editor of the SingPoWriMo 2018 anthology. Currently, Stephanie curates and hosts a monthly spoken word night called Spoke & Bird which features local and international spoken word poets and the occasional musician and has an open mic. She is also a stand up comedian who performs regularly around Singapore and runs a comedy and storytelling night called Siao Char Bors which aims to highlight female and non-binary comedians. She has opened for local and interntational comics such as Kumar, Lynn Ruth Miller, John Robertson and Garron Chu and performed at the Singapore Comedy Fringe 2017, and was a finalist at the Magners ‘So You Think You’re Funny?’ Comedy Competition 2018. 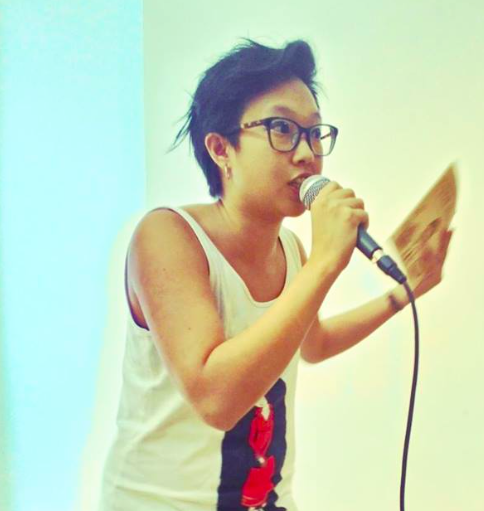 She also co-organises Indignation, Singapore’s annual independent LGBTQ Pride Month. She claims her poetry comes from the raising of an eyebrow at the absurdity of the world, being angry, being absurdly angry, making fun of at what makes her angry, humans (the joys and horrors of interacting with them), and growing up with a lot of animals. She is inspired by places like trains, buses, this one forest in Ohio and the rainforest of Singapore. please stand up! an ovation finally!